Inhalation Sedation (“laughing gas”) is available at Canberra Dental Care. Are you nervous about attending the dentist? We can help. We realise that some people have a fear of the dentist, based either on a previous bad experience or because of how dentists are portrayed in popular culture. There are a number of ways we can help to reduce your anxiety and help you have good oral health. For other tips see our FAQ. Having a good relationship with your dentist is the first, and probably the most important, element. If you don’t trust your dentist you don’t have a foundation for a successful treatment. We also offer conscious sedation at our practice which can help you relax. 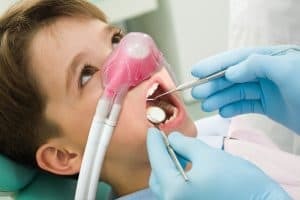 Commonly called laughing gas, Nitrous Oxide is the mildest form of sedation and can be safely administered in the dentist chair. How does Inhalation Sedation (“laughing gas”) work? A nasal hood is put over your nose which is connected to the Accutron Digital flowmeter. The flowmeter controls the delivery from the gas tanks. You breathe normally through your nose while the dentist completes your treatment. You will be conscious throughout the whole treatment, so you will be able to hear, see and respond to your dentist and what is going on around you. Because the gas is administered through the hood there are no injections required for the sedation – anaesthetic injections are still required but an given after you are sedated. The gas starts to work very quickly once connected. Within 20 seconds it will reach your brain and you will feel the relaxation effects within 2-3 minutes. Your dentist will titrate (adjust) the percentage of gas you inhale in response to your state of relaxation. The system is completely safe with a minimum of 30% oxygen being delivered at all time; the atmospheric air you breathe is only 21% Oxygen!! The gas is also quick to stop working. Once the gas it turned off it is eliminated from your body within 3-5 minutes. If you suffer from respiratory issues (breathing difficulty) such as emphysema. We do not recommend using the gas while you are pregnant. Inhalation sedation has not been proven safe during the first trimester of pregnancy. If you are, or suspect you are, pregnant please make sure to notify your dentist. Do I need to bring anything/anyone with me? No. After the gas is switched off the effects wear off within 3-5 minutes. This means that for most people there are no long lasting effects. You are safe to return to work or drive yourself home afterwards without needing to bring a second person with you. However if you are in anyway concerned about the lasting effects or have previously had any issues, we advise someone else to drive and to take you home to rest. When you make your appointment we ask that you tell the reception staff that you would like to use the gas so we can schedule use of the system for you. Does it cost extra to use Inhalation Sedation (“laughing gas”)? Yes. This is because of the cost of the gases and equipment. Use of the inhalation sedation is charged at $88 per half hour session. There is a health fund code. It operates the same was as any other dental treatment. Your dentist will provide you with all cost estimates before commencing treatment.